Can you believe I’ve never been to New Orleans — till now? Me neither. I’m here until Saturday for the Association of Food Journalists annual conference. Our agenda is full-up (and yes, Leslie, I’ll give John Besh a big kiss for you). I got in late last night and whoa: it’s ghastly humid here. After checking in at my hotel near the French Quarter, I took a languid stroll in hope of finding some cold oysters and an even colder beer. 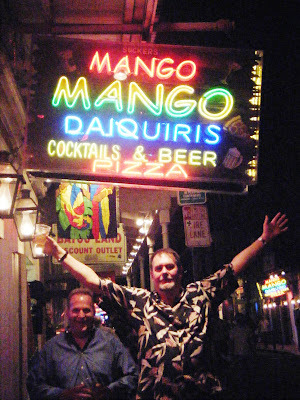 Instead, I ended up on Bourbon Street, which was every bit as much of a zoo as I’ve always imagined — only more so. Boys Gone Wild round midnight. on Bourbon Street. 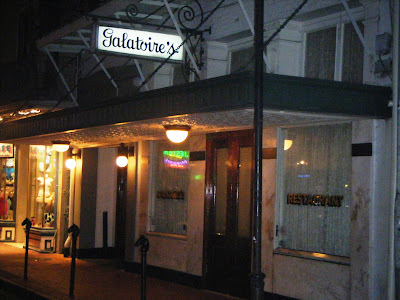 Acme Oyster House and Galatoire’s were already shuttered (and I thought this city didn’t sleep). Well: you know what Scarlet would say. So I ended up drinking a frozen dacquiri — which apparently is as popular here as a non-fat latte is in Seattle. 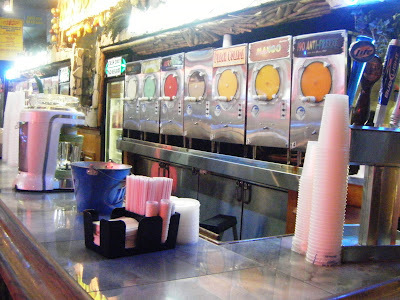 Bourbon Street’s answer to Starbucks: there’s a dacquiri shack every six steps. And for my late-night dinner, I had a Philly Girl’s version of a New Orleans ‘po boy at a joint called Mr. Chubby’s Cheesesteaks, owned by a guy named Eric Cohen who (who knew?) grew up in my neck of the woods in Philly. 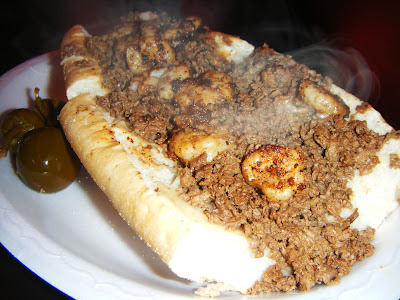 When I asked him which cheesesteak I should try he said, “Do you like shrimp?” Yep. “You hungry?” Yep. “Have the surf and turf!” So I did. And no, I didn’t have it “wit whiz” — though Eric said he goes through plenty of that liquid cheese product. Chopped steak, chile-sauce shrimp and provolone on an Amoroso’s roll. Yo, Eric! Who you callin’ chubby? The next few days are certain to be very, very busy. When I’m not eating, I’ll be tweeting. You can keep up with me here on the blog via the Twitter feed below, or on my Twitter page. Now excuse me while I let the goodtimes roll. And do tell: if you were here, where — and what — would you eat? 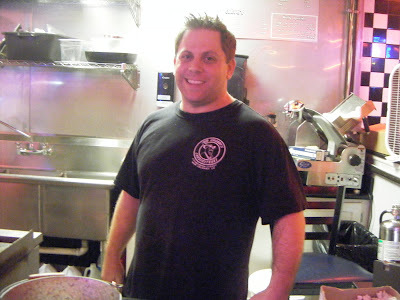 Comments | More in Restaurants | Topics: Get out of town!